Fingers and keys: In February, Sofia began piano lessons. We were fortunate to be able to employ Cameron's first piano teacher, who had taken a hiatus from teaching but returned just in time to accept Sofia as a student. So far, Sofia is practicing every day and enjoying her daily improvement. Eight is GREAT! : Sofia turned 8 on a January Sunday and had a busy birthday weekend. She brought chocolate cupcakes to Dutch class on Saturday morning (as well as to class the following Monday morning), thus enjoying celebrations with all her classmates. On Sunday morning, Grandpa and Cameron joined us for a breakfast of chocolate chip pancakes—Sofia's request—and gift opening. We spent much of the day picking up birthday cake and balloons, packing up party supplies, and generally preparing for her dragon-themed pool party. 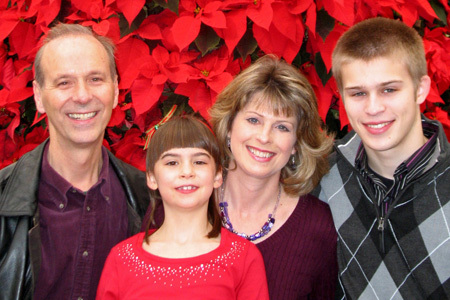 Then we met Sofia's 17 guests at the Mountlake Terrace recreation complex. The kids had a blast swimming for an hour, then gathered in the Jungle Room for an hour of pizza and cake. The party culminated in a piñata bash—except that even with 36 hits from a baseball bat swung by18 kids, the beautiful dragon piñata refused to break! Finally, Jan poked a hole in the top and dumped out the candy, at which point the children covered the floor like a swarm of cockroaches. It all was a great success! 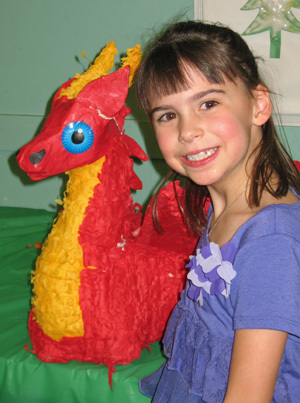 Sofia with her (now empty) dragon piñata. Snow! Meteorologists are saying it's our most impactful snowfall in years, and on January 19th the governor declared a state of emergency in western Washington. 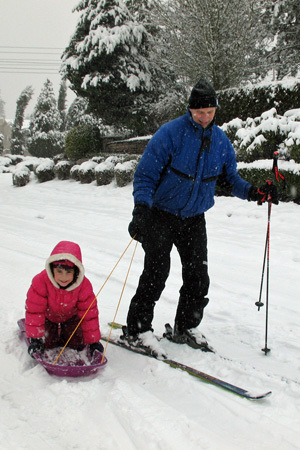 Snow began falling in Kirkland on Saturday, the 14th. We were lucky that Monday, the 16th, was the holiday of Martin Luther King, Jr., and Sofia reveled in a snow day. Her school opened late Tuesday, but unsafe road conditions required that it be closed (along with most other area school districts) the rest of the week. Our neighborhood lost power Wednesday evening at 5:00; we were fortunate that work crews repaired the problem about 2:30 Thursday morning so that we didn't wake in a 30-degree house. Many others were not so lucky; late on Thursday, the 19th, over 230.000 people were without power in below-30-degree temperatures. Even Sofia has tired of the cold and wet! Happy holidays! A wonderful December to all!